Assalamu'alaikum Wa Rahmatullaahi Wa Barakaatuhu. Halo dear Hijabers, how are you doing? We wish all of us always in highest kepercayaan and health, insyaAllah. In this post we would like to share with you about our Islamic Study Group with NooR Magazine. On 14th December 2010, was invited to attend Islamic Study Group at Noor Magazine. 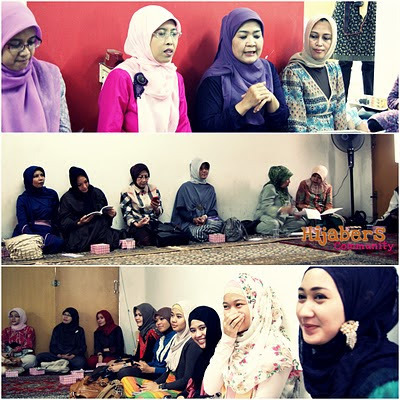 Hijabers attending this event include Anneke Scorpy, Ghaida Tsurayya, Wulandari, Ekamayya, Sendy Monarchie, Dian Pelangi, Restu Anggraini, Hanna Faridl, Liya Asri, Noria Hasibuan and Fithri Widanarty. The Islamic Study Group opened by Noor’s Editor in Chief, Mrs. Jetti Rosila Hadi followed by the reading of Surah Al-Mu’minun 1-11 as well as the interpretation by Ghaida Tsurayya and Noria Hasibuan. The theme for this gathering is ‘Welcoming Islamic New Year by Enhancing Our Inner Beauty’. Most people often concern only their outer beauty rather than their inner beauty. Outer beauty is the physical look of a person that can be seen with our two own eyes while inner beauty is the personality of the person that we can only feel it. It is inevitably that all people judge a person firstly from the physical look, hence many people are busy enhancing his/her outer beauty rather than the inner beauty; by going to beauty salon, fitness, having body treatment, skin care, and wearing beautiful outfit so that they can look beautiful. But in fact, to look beautiful from the outside is not enough to make us a person with a fascinating figure, because the real beauty is actually coming from the inside. Outer Beauty has its limit, it cannot be upgraded continuously; it has its climax point where it cannot improve further, in fact it will slowly decrease through time. Where as for inner beauty, it has no limit; people can upgrade it continuously throughout their lifetime. The older a person gets the stronger their inner beauty if they keep upgrading and maintaining the quality. Hence it is very important for us to concern more on sharpening the inner beauty rather than the outer beauty. With a great inner beauty, we will automatically understand and aware that outer beauty is also important. But at this stage, we have understood that the outer beauty is only the supporting tool for characterizing our inner beauty but that is not the main thing in our life. We have to always remember that Allah SWT, the One who creates us, does not see us from the look or the body of a person but from the quality of their heart. Adab of eating & drinking: Start eating by saying Basmallah and finish it by saying Hamdallah. Adab when sneezing: Lower the tone, close mouth and face, and also say Alhamdulillah. That was the summary of our Islamic Study group with Noor Magazine. Thanks to NooR Magazine for inviting us and sharing knowledge about ‘Inner Beauty’. Insya allah from now on, besides beautifying the outside, we also keep beautifying our inside too. Bismillah. 0 Response to "Fashion Enhancing Our Inner Beauty"